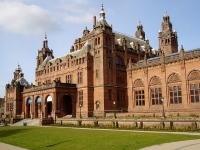 Glasgow's principal art gallery and museum, the Kelvingrove is one of Scotland's most popular free attractions. This imposing red sandstone building, opened in 1901, houses a superb collection of paintings by old masters such as Botticelli, Rembrandt, Monet, Van Gogh and Picasso, as well as an impressive display of European armour, military weapons and prehistoric relics. There are 22 themed galleries containing an incredible 8,000 artefacts and objects from all over the world and covering extremely wide-ranging interests and subjects, ensuring that every visitor should be able to find something that genuinely interests them in the museum. For many people, the main attraction of the permanent collection is a room dedicated to the works of the 19th-century architect Charles Rennie Mackintosh, who studied at the Glasgow School of Art and designed many of the city's great Art Nouveau buildings. The museum also hosts regular temporary exhibitions, for which visitors are usually charged a small entrance fee. There is a pleasant restaurant at the museum, and a shop for souvenirs. Kelvingrove is one of the top attractions in the city and generally receives rave reviews from tourists.